Introduced to me via a reader comment. I delete twenty or more spam posts per day on this blog. So every now and then when someone posts a genuine comment it is a cause for celebration. Loved this from Annette, who is the vocalist, and PR agent for this prog duo. I’m going to let this article take the form of quoting her comment in full and then inserting my thoughts into the text. Hi, I’m a real person from the unsigned prog band: The Light Afternoon. Right out of the box, I love the opening line. “I am a real person“. The spam filter did manage to put this into “pending” but I would have spotted this even if it had ended up in the “spam” folder. And it’s quite true, she’s a real person in a real band. So here’s a track by “The Light Afternoon”, from their Soundcloud page. I am sort of reminded of Kate Bush with the vocals but musically it is not so easily accessible. It will take a few listens to get into it. Worth the effort though. Artwork for My Parallel Life, album by The Light Afternoon. We are a studio based project created by Steve Newland. Basically, he does everything (guitars, keyboards, programming, recording etc, etc), while I do the vocals and the artwork. Steve has always been involved in music and has played in various bands. But I never had been, I merely sung to myself all the time, but never publicly! But by a quirk of fate, when Steve couldn’t find a singer in 2002, he persuaded me to have a go. Well, we’ve been working together under different guises since then, doing various different styles and concepts, but we seem to have finally clicked under the prog banner. After all, we grew up with it:-) (Yes, we’re not young!) We both like lots of other styles of music and bands too. Annette has basically written the article for me here. 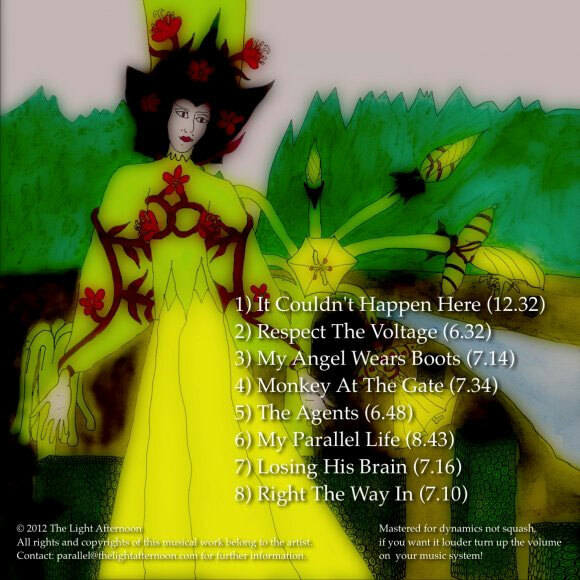 Album sleeve reverse, listing track titles. 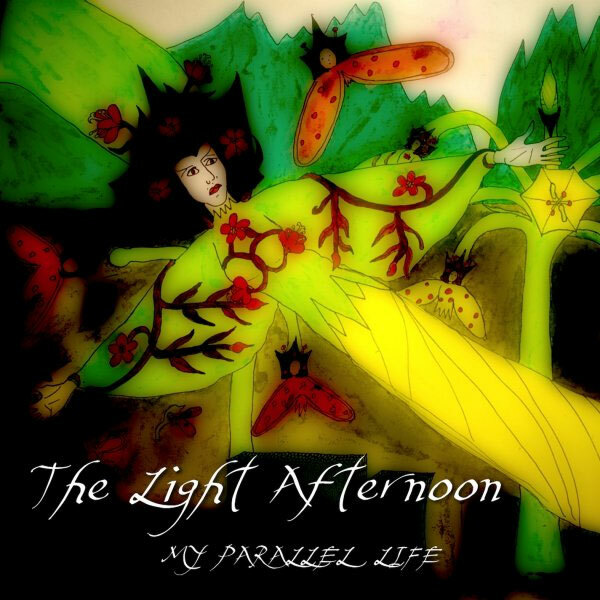 We have had positive reactions to our album: “My Parallel Life” which we self produced in December 2012, and our music has been played on various Prog radio shows since then, but we still need more coverage. I came across your blog by chance and I think what you are doing is really important, because there is so much really good music out there that has no way of being heard unless people like yourself make the link. And by the way, I listened to your radio show on Sunday 6 October 2013 and I really liked Helghyer, The Beast Of Bodmin is a really great track. Hopefully your other listeners will also think so. Flattery will get you everywhere. And thank you for the reminder, I still have a draft article about Helghyer awaiting my further attention. So I was wondering whether our music might interest you, your readers and your listeners. ….. I should certainly think so. Yes. Keep up the good work Olli of promoting unsigned bands. I fully intend to, but let me assure you the task is so much easier when I get encouragement like this. Thank you Annette. Buy My Parallel Life on Amazon. ‹ Would you like to write for this blog? I’m sure our music will grow on you if you give it a couple of listens. It’s sort of a concept album but it’s impossible to explain simply, what the concept actually is:-) I like to think that our music is an experience that envelops one. I was originally inspired to post my comment because I saw you had the prog band Lifesigns mentioned on your “Unsigned Bands” page (I hope you’ll include us there too now). The number of people getting into this genre (progressive rock) is growing all the time, especially with younger people getting into old favourites like Focus, Genesis, Jethro Tull etc for the first time, along with new favourites like Porcupine Tree, Riverside, The Flower Kings to name but a few, and also discovering the huge amount of new unsigned bands from all over the world (including The Light Afternoon!). Yes I am sure it will grow on me, and others. I will add you to the band list and I look forward to reviewing your stuff in the future with a better understanding born of familiarity.